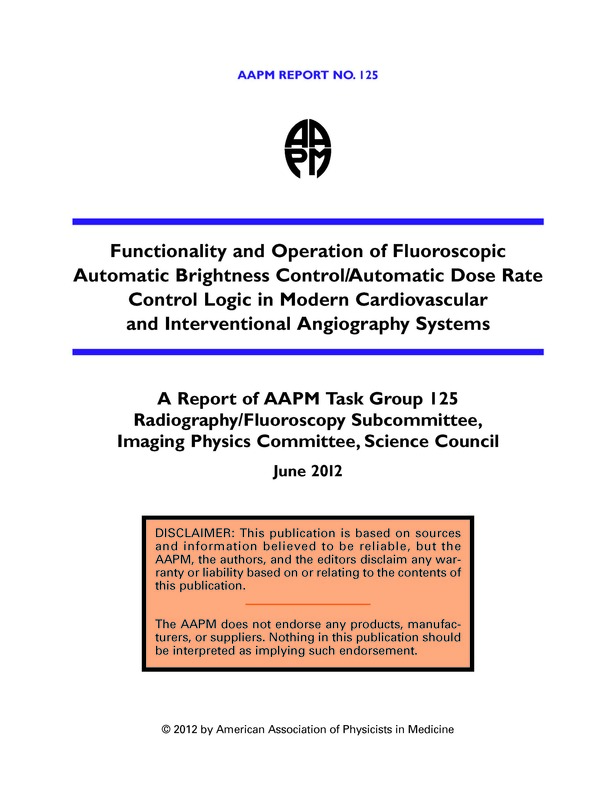 Task Group 125 (TG-125) was charged with investigating the functionality of fluoroscopic Automatic Dose Rate and Image Quality control logic in modern angiographic systems, paying specific attention to the spectral shaping filters and variations in the selected radiologic imaging parameters. The task group was also charged with describing the operational aspects of the imaging equipment for the purpose of assisting the clinical medical physicist with clinical setup and performance evaluation. Although there are clear distinctions between the fluoroscopic operation of an angiographic system and its acquisition modes (digital cine, digital angiography, digital subtraction angiography, etc. ), the scope of this work was limited to the fluoroscopic operation of the systems studied. The use of spectral shaping filters in cardiovascular and interventional angiography equipment has been shown to reduce patient dose. If the imaging control algorithm were programmed to work in conjunction with the selected spectral filter, and if the generator parameters were optimized for the selected filter, then image quality could also be improved. Although assessment of image quality was not included as part of this report, it was recognized that for fluoro- scopic imaging the parameters that influence radiation output, differential absorption, and patient dose are also the same parameters that influence image quality. Therefore this report will utilize the terminology “Automatic Dose Rate and Image Quality” (ADRIQ) when describing the control logic in modern interventional angiographic systems and, where relevant, will describe the influence of controlled parameters on the subsequent image quality. A total of 22 angiography units were investigated by the task group and, of these, one each was chosen as representative of the equipment manufactured by GE Healthcare, Philips Medical Systems, Shimadzu Medical USA, and Siemens Medical Systems. All equipment, for which measurement data were included in this report, was manufactured within the 3-year period from 2006 to 2008. Using polymethylmethacrylate (PMMA) plastic to simulate patient attenuation, each angio- graphic imaging system was evaluated by recording the parameters Tube Potential in units of kilovolts peak (kVp), Tube Current in units of milliamperes (mA), Pulse Width (PW) in units of milliseconds (ms), spectral filtration setting, and Patient Air Kerma Rate (PAKR) as a function of the attenuator thickness. Data were graphically plotted to reveal the manner in which the ADRIQ control logic responded to changes in object attenuation. There were similarities in the manner in which the ADRIQ control logic operated that allowed the four chosen devices to be divided into two groups, with two of the systems in each group. There were also unique approaches to the ADRIQ control logic that were associated with some of the systems, and these are described in the report. The evaluation revealed relevant information about the testing procedure and also about the manner in which different manufacturers approach the utilization ofspectral filtration, pulsed fluoroscopy, and maximum PAKR limitation. This information should be particularly valuable to the clinical medical physicist charged with acceptance testing and performance evaluation of modern angiographic systems.